As a child, I toured a mansion with my parents that had a round tower room with curved window glass and a round bed. I was hooked on round. Since then, it has been my favorite architectural shape. While later living in Taiwan as a young woman, I often visited a family that had a large Chinese scroll painting on a wall depicting a scholar sitting in a hut at a round window. I vowed that some day, I would have a house with round features like the window in the painting. 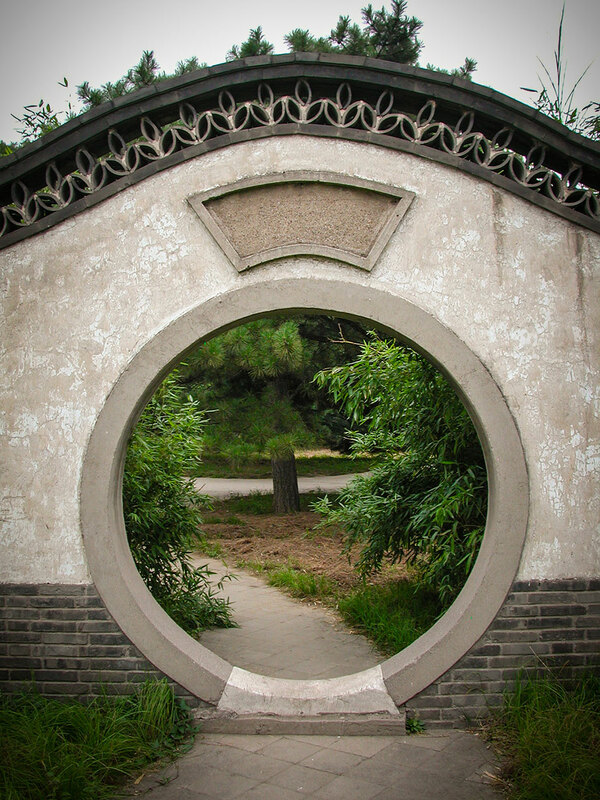 We spent a great deal of time during our 13 years of living in China at historical sites and parks with round moon gates, some of which had heavy round wooden doors split in the middle so that both halves could be opened. Chinese architects ancient and modern often make whimsical round doors and windows. 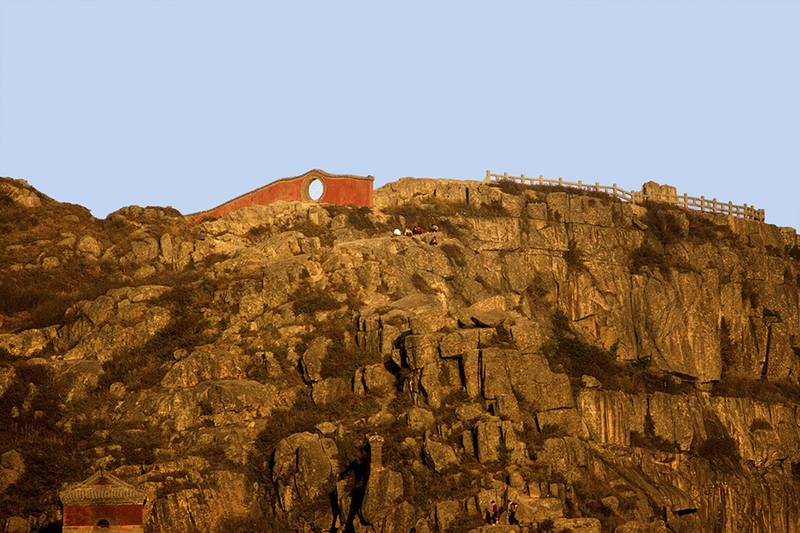 ...and this one is a round gate at the top of China's most sacred mountain, Tai Shan. I later was disappointed when the builder of a home we had built in North Carolina was not interested in installing a large round window in our loft. Of course, I had read J.R.R. Tolkien’s Lord of the Rings and The Hobbit and seen the first Star Wars trilogy with Yoda’s house of round windows, but I didn’t strongly associate my love for round doors and windows with hobbits or other small fantasy creatures until Peter Jackson’s movie trilogies. The movies inspired the building of many round doors, and I started to collect pictures of round doors from Pinterest and other sources. I realized that my eccentric obsession with round had become a real possibility. It was time to have a house with round features. When we met with architect Greg Steffensen to plan the building of The Thoughtful House, I hesitantly asked about the possibility of installing a round door and a couple of round windows and showed him my photographs. To my joy, he was enthusiastic about the idea and incorporated a round door, two round windows and a staircase with a rounded landing in the home. It turns out that he had lived and worked in Japan, where round doors, garden gates and windows are often used in architecture. Greg designed a door that opens as an ordinary one does, but has a round frame with windows on the sides so that when closes it looks like a round door. This resolved our practical concerns about having a heavy round door that would be regularly used. 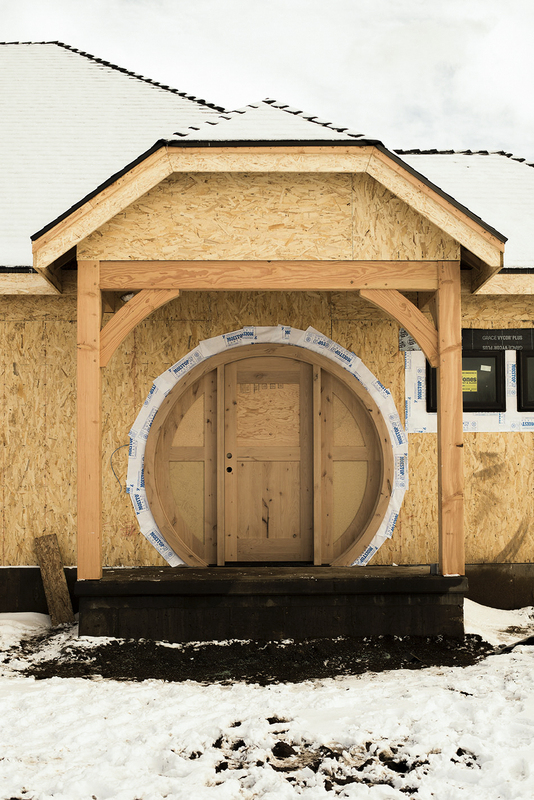 We were lucky enough to have a house framer, Don Eldredge of Eldredge Construction Services LLC, who is experienced with round architectural features and created the openings for the round doors and windows. “I’ll build round all day long,” Don said. 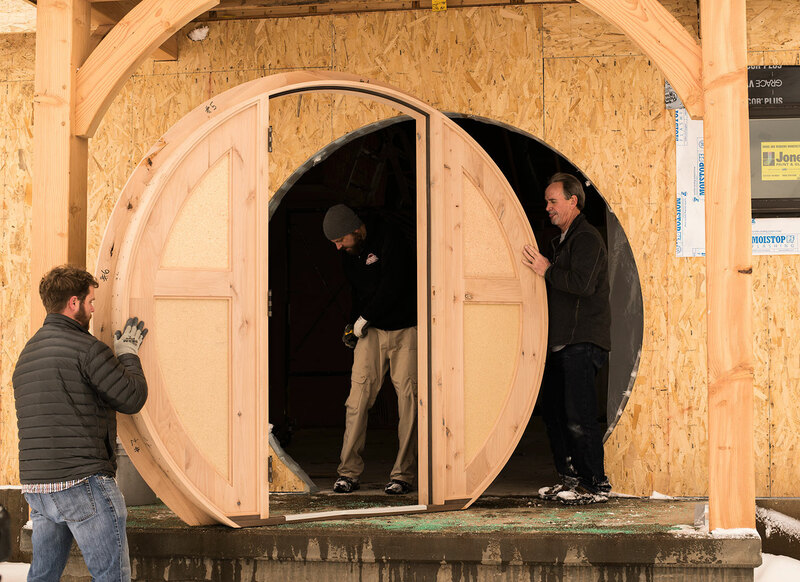 Taking Greg’s designs to Sunroc Custom Doors in West Valley City, Utah, we met with Dan Draper, who believe it or not is an experienced designer of hobbit-style doors. He developed Greg’s general drawings into a delightful detailed design with all of the requisite parts required for it to function as a regular door. Sunroc’s artisan carpenters built the door, including a thoughtful bonus of wood grain on the door’s bottom central panel that resembles the wizard Gandalf’s mark on Bilbo’s door from The Hobbit. Dan and Jeff Brown of Sunroc installed the door just before Christmas. The glass and hardware for the door have not yet been installed, but the door will soon have a leaded-glass window with a round design in the top panel and glass panels on the sides. Many thanks to Greg, Dan, Jeff, Don and our builder, Kelly Adams of A2Z Management and Construction, for helpiing to make round architecture the dominant feature of The Thoughtful House. Photos by Forrest Anderson. Music from audiojungle.net.